I recently decided to take a good look at the search terms that drive traffic to my blog. Some of the top terms are common, everyday-type foods (like enchiladas and stuffed peppers), but I was shocked by how many people were out there searching for frittata recipes. (Maybe they’re more common than I thought?) It then occurred to me that while I used to make frittatas so often that it was almost an obsession, I haven’t posted a frittata on this site in ages. (Since October 14 of last year, to be exact!) 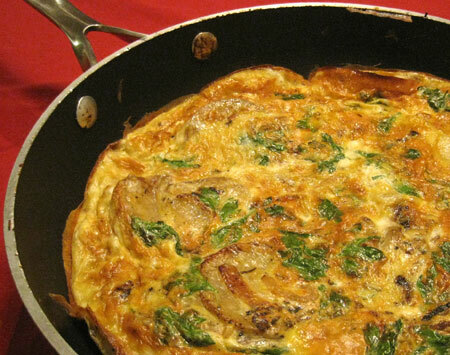 I turned to my breakfast recipe spreadsheet to find a quick and easy option with inexpensive ingredients, and the Potato and Onion Frittata recipe from the January/February 2006 issue of Everyday Food fit the bill perfectly. First, I prepped my veggies. I peeled, halved, and thinly sliced 1 large onion and 1 8-ounce baking potato. In a medium (10-inch) nonstick broilerproof skillet, I heated 1 tablespoon of olive oil over medium heat. I added the onion, potato, and 1/2 teaspoon of crumbled dried rosemary, seasoned with coarse salt and ground pepper, and tossed everything to combine. I covered the skillet with its lid and cooked the veggies for 10 minutes. Next, I uncovered the skillet and cooked the mixture, tossing occasionally, until the onion and potato were tender (about 5 minutes). At this point, I started heating the broiler so it would be ready for the last step; I also made sure a rack was positioned in the upper third of the oven. I added another tablespoon of olive oil to the potato-onion mixture in the skillet and poured in the egg mixture. I cooked the frittata over medium-low heat (use low or medium-low, depending on how hot your stove gets), lifting the mixture a few times around the edges to let the egg flow underneath. Once the frittata was almost set in the center (12 minutes for me, 10 minutes according to the recipe), I put the frittata under the broiler until it was set and golden brown (3 minutes). The photograph shows the frittata still in the skillet, but it released very easily; I just ran a clean spatula around the edges and slid it out onto a plate for cutting and serving. After all this frittata-less time, it was sure nice to have one for dinner. This one was a bit thinner than what I’m accustomed to; it was almost like a thick egg pancake. It was really delicious, though, with the tender potato, charred onion, and fresh herbs. This frittata is especially healthy (only 5 Weight Watchers points for an entire quarter of the dish) because there’s no cheese, but I didn’t think it was lacking in the flavor department at all. The only thing I would do differently next time is that I would stir the potatoes and onions halfway through the covered cooking time. I’m a huge fan of charred bits and I think they add a lot of flavor, but letting the potatoes and onions sit undisturbed in that hot oil for ten whole minutes was almost too much. If charred bits make your day (Christopher, I’m talking to you! ), though, give the recipe a whirl as is. As many of you probably know by now, I’m a bit of a brunch fiend. I love the idea of a relaxed late morning/early afternoon meal, especially one that is likely to involve mimosas, and *especially* one where you have license to chow down a bit more than usual because it’s two meals rolled into one. Ah, heaven. My latest brunch experiment is Ham and Potato Bake from the March 2005 issue of Everyday Food. This is another one of those recipes I’ve had my eye on for quite some time, but I hesitated to make it because it makes ten servings (for just us two people). Curiosity finally got the best of me, though, and I decided to give it a shot. Thankfully, the leftovers reheat beautifully (if a bit messily). In a large bowl, I whisked together 6 large eggs and 1 1/2 cups of heavy cream (naughty, I know); I seasoned the mixture with salt and pepper. Next, I used the slicer blade on the side of my box grater to thinly sliced 2 baking potatoes (1 1/4 pounds total). (The recipe said the slices should be no thicker than 1/4 inch; mine were thinner. I’m not sure they would have cooked through completely if they had been much thicker. If you have a mandoline – I don’t! – this is the perfect time to get it out.) I dropped the potato slices into the egg mixture. To assemble the dish, I used a slotted spoon to lift half of the potatoes out of the egg mixture. I arranged them in the bottom of the prepared pan and then topped them with 10 ounces of sugar-baked ham (thinly sliced), 10 ounces of frozen broccoli (thawed and squeezed dry with paper towels), and 1/2 cup of grated cheddar cheese. I lifted the remaining potatoes out of the egg mixture, arranged them on top of the cheese, and poured the egg mixture over the top of the dish. Using the same slotted spoon, I pressed down on the top layer of potatoes to make sure they were completely submerged in the egg mixture. I put the pan on a baking sheet (just in case! ), covered the pan with foil, and baked the dish until the potatoes were tender (about 1 hour). Next, I removed the foil and put the casserole back in the oven until it was golden and set (about 45 more minutes). I let the casserole cool in the pan for 20 minutes, ran a knife around the edges, and carefully inverted it onto a plate. I peeled off the parchment, reinverted it (so we could see that beautiful browned top), and cut it into wedges using a serrated knife. Yuuuum-MY. This was so incredibly delicious. (I’m sure the heavy cream had something to do with it, but what is life without the occasional indulgence?) I’m a big fan of broccoli-cheese combinations (broccoli-cheese rice, anyone? ), and the ham was a terrific addition. The potatoes were perfectly tender, and the browned edges were exceptionally tasty. We managed to eat about a third of the dish that first night. It became dinner the next night and Dr. O’s lunch on the third day. As I said, it reheated beautifully in the microwave… I cut each wedge in half for more even cooking and gave each serving 2 – 3 minutes of high heat. It popped a *lot*, but I’d still rather spend 5 minutes cleaning the microwave than 30 – 60 minutes cooking up another meal. TIPS: Any 9-inch cake pan will work fine for this recipe, but I’ll admit that I used a silicone one to make removing the dish from the pan as easy as possible. I have a pan like this one, but in red. My only “complaint” about the dish is that I had to make sure the ham was *completely* cut through before removing the slices from the plate. I didn’t manage a complete cut on my first slice, and the ham layer actually slipped clean away from the slice as I pulled it out. Next time, I think I’ll cut the ham slices into thin strips before layering the meat to prevent this from happening. Happy 2009, everyone! Hopefully, you had a fun and safe New Year’s Eve and New Year’s Day. Our NYE was a bit lame, I’ll admit – poor Dr. O has been sick, so we spent the night in – but we had a nice day yesterday brunching, watching football, and relaxing with one of our dearest friends. Speaking of brunch, it’s one of my favorite meals. 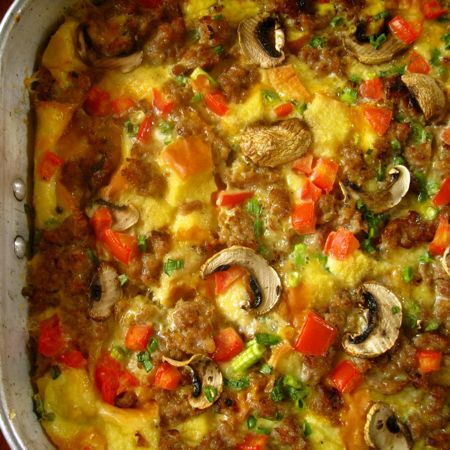 We have a long tradition of breakfast casserole at my parents’ house, and I’m always looking for new, crowd-pleasing brunch options. That was my motivation for trying today’s recipe – Goat Cheese Quiche with Hash-Brown Crust from the December 2005 issue of Everyday Food. I squeezed the excess moisture from 1 pound of thawed (previously frozen) hash browns and placed them in a large bowl. Next, I added 2 tablespoons of softened butter, 1 egg, 1 teaspoon of coarse salt, and 1/4 teaspoon of pepper. I mixed everything together and used a buttered measuring cup to press the potato mixture into the bottom and sides of the prepared springform pan. I placed the pan on a rimmed baking sheet and baked the crust at 375F until it was set (about 20 minutes). While the crust baked, I whisked together 1 1/2 cups of reduced-fat sour cream, 1 package (5 ounces) of soft goat cheese (at room temperature), 1 1/2 teaspoons of coarse salt, and 1/4 teaspoon of pepper in a large bowl. When those ingredients were well combined, I whisked in 11 eggs. Once the crust had finished baking, I poured the egg-cheese mixture into the pan and sprinkled it with 4 thinly sliced scallions. I put the pan (still on the baking sheet) back in the oven until the quiche was set (about 50 minutes). To serve, I unmolded the quiche, peeled off the wax paper, and cut it into slices. This quiche was so beautiful when it came out of the oven… The look of the hash-brown crust is really elegant, almost like a crown. Unfortunately, the taste didn’t really live up to the appearance. I like goat cheese, but it just didn’t seem to work that well in this dish. What I *do* think would work would be substituting cream cheese for the goat cheese and maybe adding a bit of diced ham. 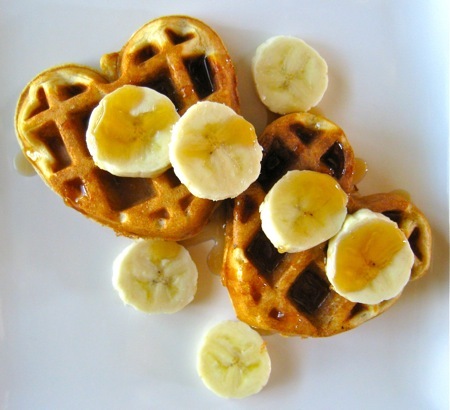 This one is gorgeous enough to be worth another try (with substitutions)… I’ll let you know how it goes! TIPS: Don’t skip the measuring cup when you’re pressing the hash browns into the springform pan. It’s essential for packing the hash browns down well enough to form a solid crust. What if you could invest 20 minutes of active cooking time to have a healthy, satisfying breakfast ready in 60 seconds or less for the next 3 days? 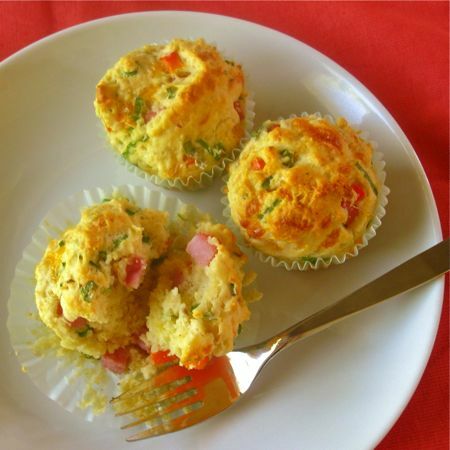 Ham and Cheese Buttermilk Breakfast Muffins from Jim Romanoff of the Associated Press is a recipe that allows you do to just that. 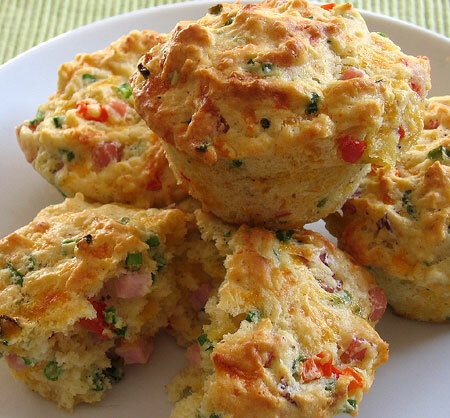 I made these easy, savory muffins on Saturday morning and we’ve been enjoying them since. In a large bowl, I whisked together 3 cups of flour, 2 1/4 teaspoons of baking powder (the recipe actually calls for 1 tablespoon, but I adjusted for altitude), 1/2 teaspoon of baking soda, 1/2 teaspoon of ground black pepper, 1/4 teaspoon of salt, and 1/8 teaspoon of cayenne pepper. In a medium bowl, I whisked together 2 large eggs, 1 1/3 cups of buttermilk, 2 tablespoons of canola oil, and 3 tablespoons of melted butter. I stirred in the prepared ham, scallions, and red pepper along with 1 cup of grated sharp cheddar cheese. I baked the muffins at 400F until the tops were browned. The recipe said 20 – 25 minutes; at Denver’s altitude, I got the results I wanted in 28 minutes. I let the muffins cool in the pan for 15 minutes, turned them out, and served them warm. Mmmm. These were seriously good. The muffin itself was moist and fluffy with great density, and I loved the chunky texture of the ham and pepper pieces. The scallions and cayenne pepper added the perfect amount of zing. I did feel like they could be a bit saltier, so I think I’ll double the salt to 1/2 teaspoon next time instead of 1/4 teaspoon. The recipe made 12 muffins, which is far more than Dr. O and I can eat on our own. I wrapped each muffin individually in plastic wrap and placed the leftovers in the refrigerator. (They’ll keep for 3 days.) As promised, these warmed up beautifully in the microwave… Each muffin just needs 30 seconds on high to be back to warm, moist, and delicious. TIPS: I always ask my deli guy or gal to slice my meats thick when I need them for dicing. The person behind the counter usually has *some* idea of how thick a slice should be to yield the amount I need (though I never expect them to get it exactly right!). Also, if you have a silicone muffin pan and you choose to use it, remember to put it on a baking sheet for support before you put it in the oven. 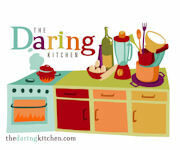 Update 8/23/12: The recipe is no longer published on the Dallas Morning News website. I’ve written it out in a separate post (and mine isn’t going anywhere! ); click here to visit.